(From a member of the Gnarlie’s) I am just blown away. What impressed me more than how our team pulled it together on the track, to win over a tough team, is the sportsmanship and the hospitality the Dames displayed. Derby is a hard-hitting game and this bout was no exception. As soon as it was over I was slapping hands with a team full of smiling faces; we came home to ‘friend requests’ on facebook, ‘thank yous’, and warm wishes from members of their team. The Dames are true ambassadors to sport of roller derby. We are so grateful to have made friends with them and can’t wait to host them in Rossland this summer. Way to leave your hearts on the track – and the dance floor! 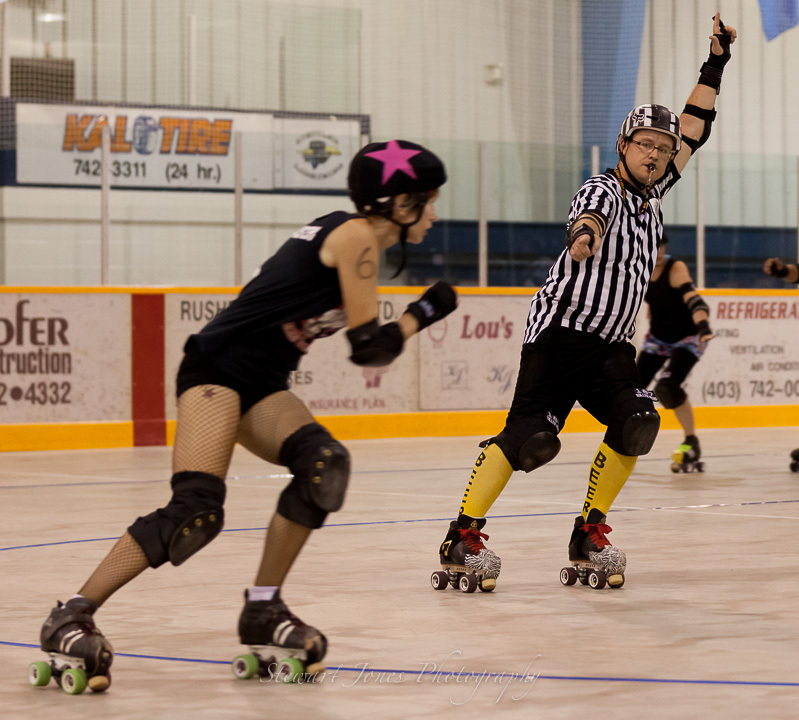 This entry was posted in Deathbridge Derby Dames, Fans, Lethbridge Roller Derby Guild. Bookmark the permalink. well said, Cherri! it’s all we’re talking about too and we cannot get enough! all of us came home with sore cheeks, both from smiling, and falling. you are an amazing team and we are very proud to have been hosted by you all. we cannot wait to repay the favour. oh, and we may make our own version of the naughty wheel. what a great idea to get the party going! Thanks! I can’t wait to make a trip out there and skate with you all again! Gotta work on my cardio!!!! You must include muff dives on your wheel, just for Scarlet!!! You gals played with style, skill, guts & soooo much lovin! Thanks for hosting an amazing bout & after party that rocked!! Derby love to you all & see you in Rossland soooon.